The Azure 45 was one of the recently renovated restaurants. 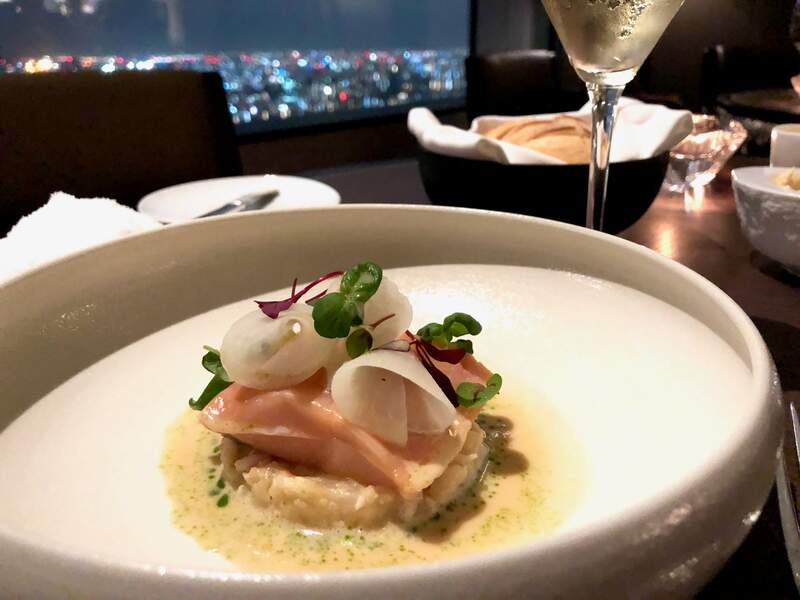 It is no surprise that here you’ll find exquisitely prepared French dishes with the best possible views of the iconic Tokyo Tower. 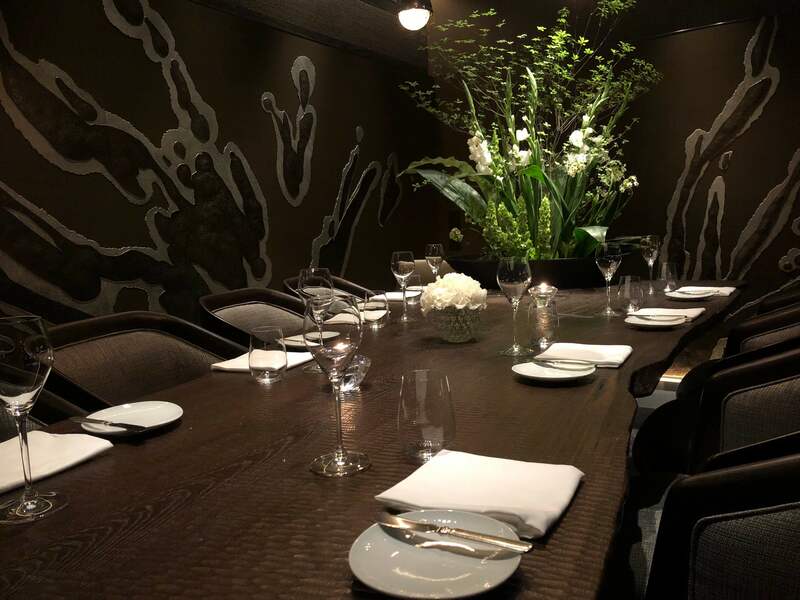 If fine dining is your thing, then this is the perfect restaurant for you. Unfortunately we didn’t have time to test it out ourselves, but it’s got a Michelin star, so you know it’s good. 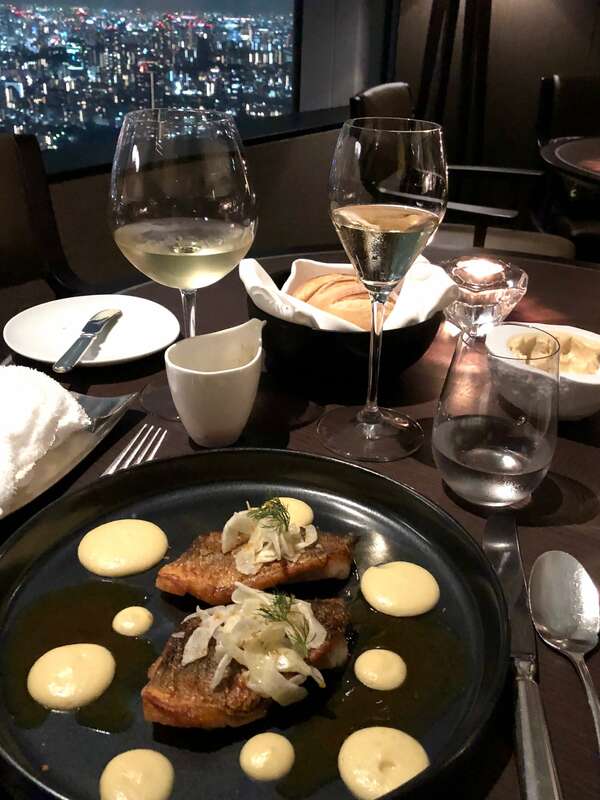 We were invited by the hotel to enjoy a dinner at the other renovated restaurant called Towers, which is right next to the Azure 45. Towers was actually better suited for us, because allthough we love great food, we still usually like to do it in a more casual setting. Towers restaurant is a perfect mix of casual and fine dining, so expect quality ingredients and proper portion sizes. The menu consists of mainly meat and seafood, so it’s easy to find something for everyone. We also had a dinner in the Hinokizaka restaurant, which in a way is four restaurants in one. Each area has been separated from each other. 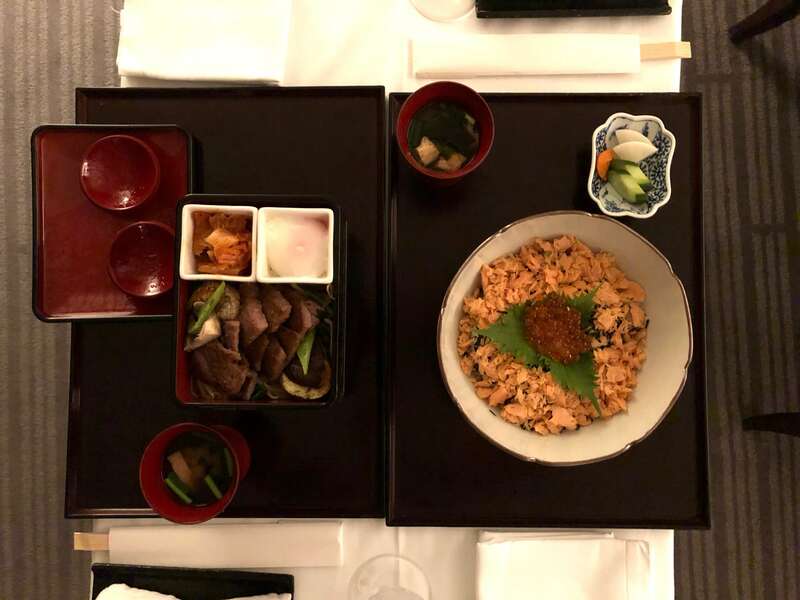 One area is for kaiseki-dinners, which is the Japanese equivalent of multicourse fine dining. It consists of multiple small food portions, that are beautifully laid out. 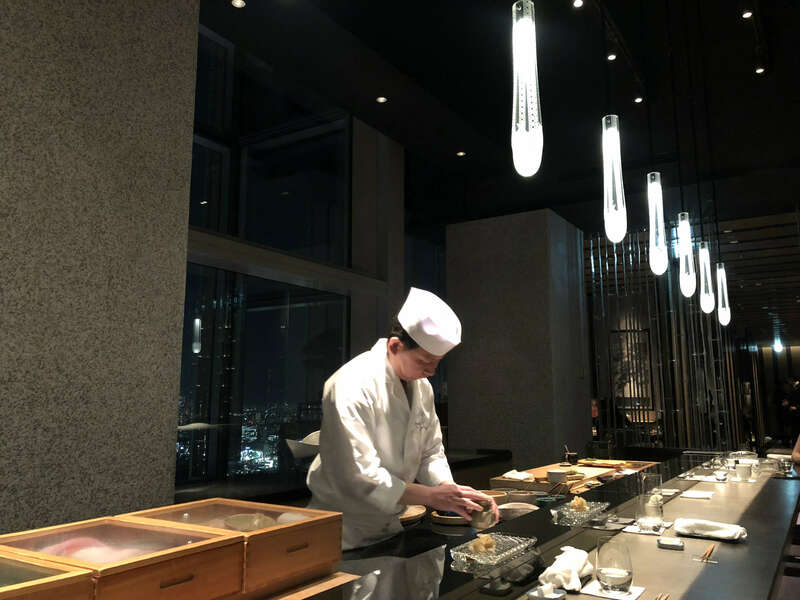 You also have the teppanyaki-grill side, where the chef prepares everything in front of you on a sizzling hot iron griddle. Then you have the tempura, which is usually deep fried vegetables and seafood in a tempura batter. However tempura is not as heavy as the Western style of deep frying, so I recommend giving it a try, if you haven’t already. And then of course there is the sushi side, where the chefs prepare the fresh sushi dishes right in front of you. 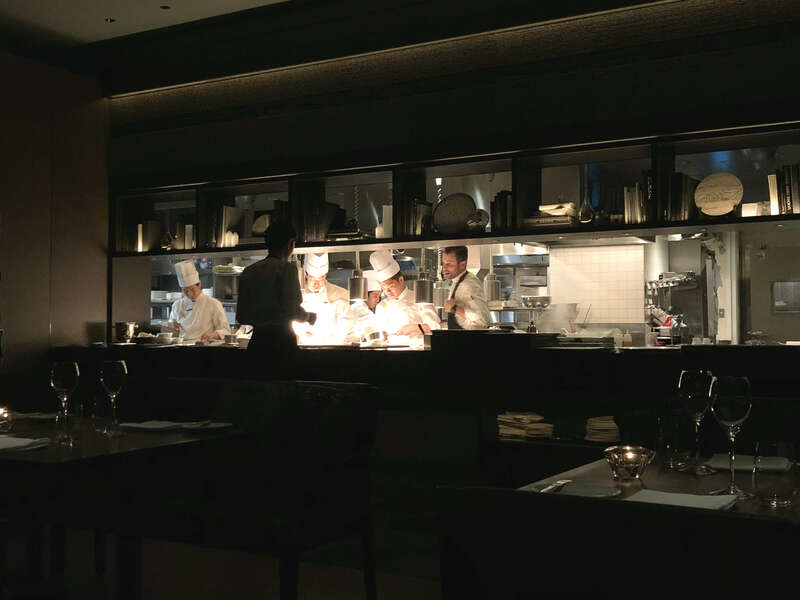 You should also know that it’s possible to order dishes from each side of the restaurant. So if for example you want to have sushi, but also kobe-beef, that can be arranged. 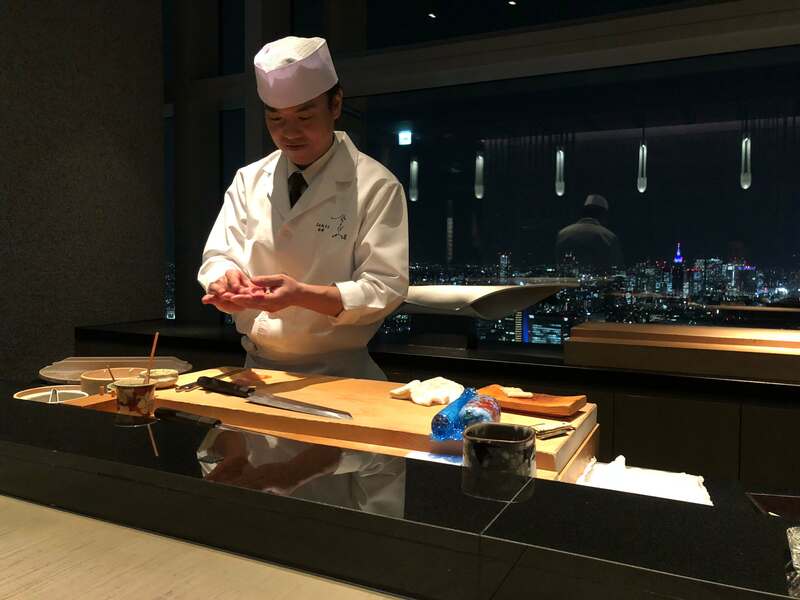 Take into account that the teppanyaki-side is the only one without a fantastic view of the Tokyo skyline, but observing the chef at work is a view of its own. 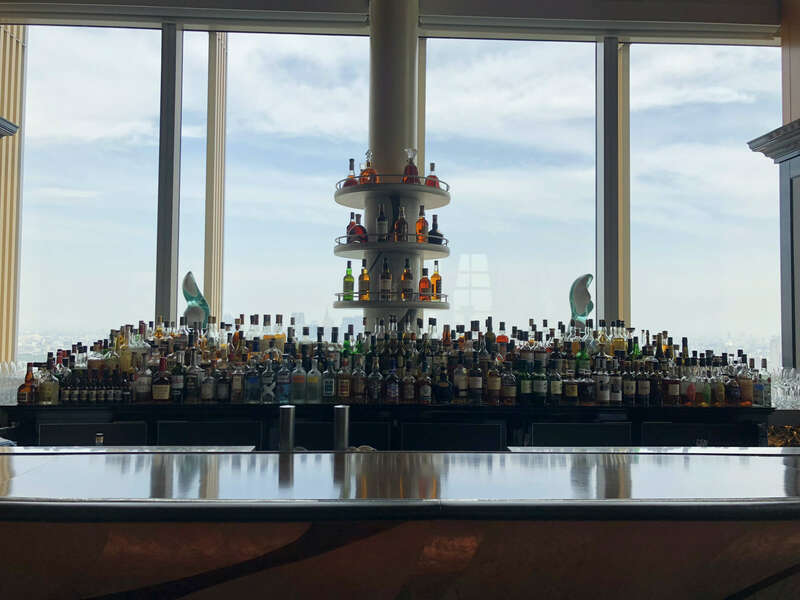 The Lobby Lounge, as its name suggests, is the main lobby of the hotel on the 45th floor. 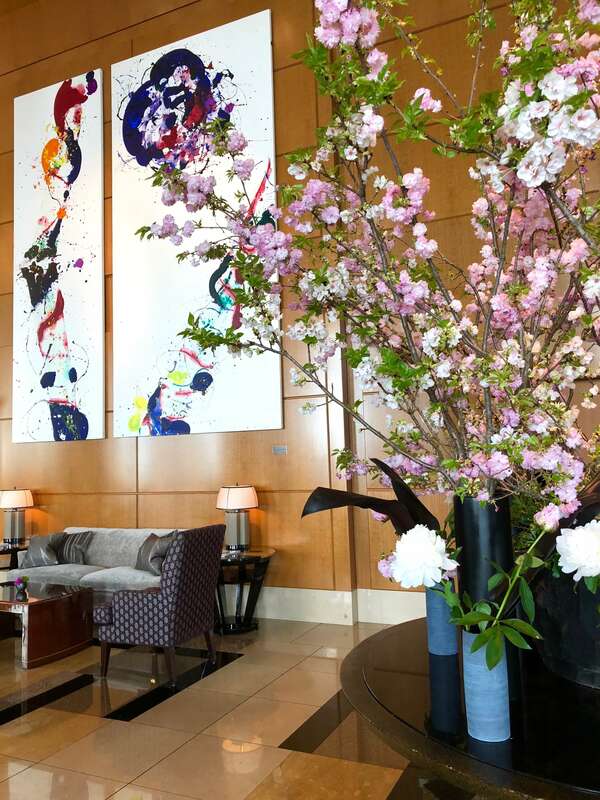 Here you can enjoy a luxurious afternoon tea or perhaps an evening of cocktails from the bar. 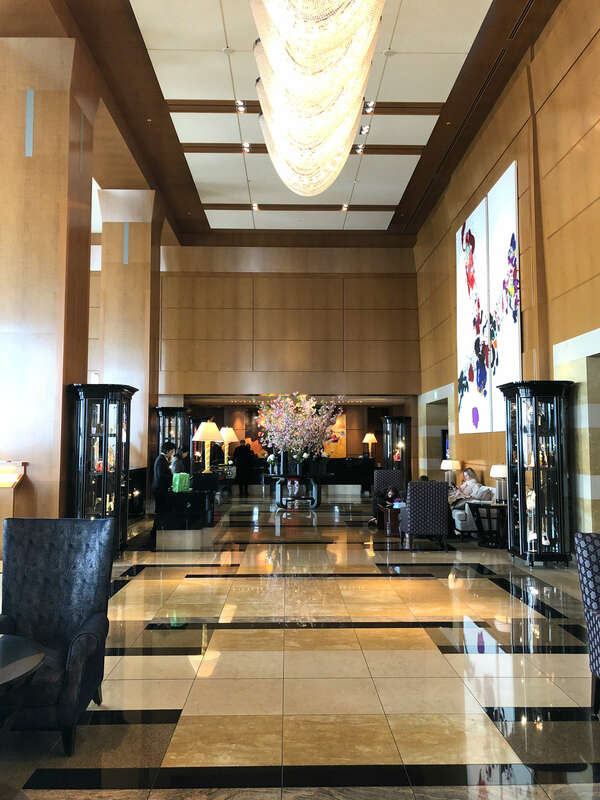 I have to say we didn’t spend any time at the Lobby Lounge, because we had the Club Lounge upstairs, but there would have been interesting things to see there. 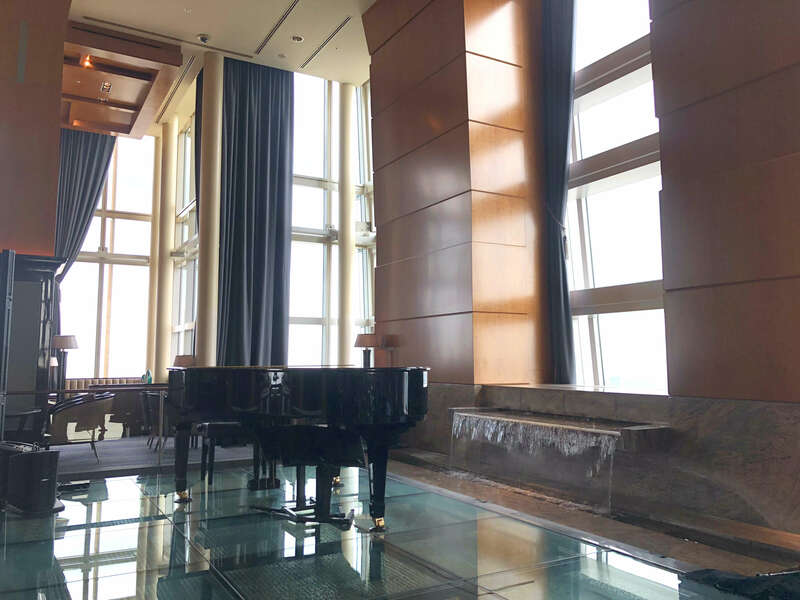 Each day there is an afternoon piano performance and also live evening entertainment, so you don’t even have to leave the hotel to get a night full of experiences. 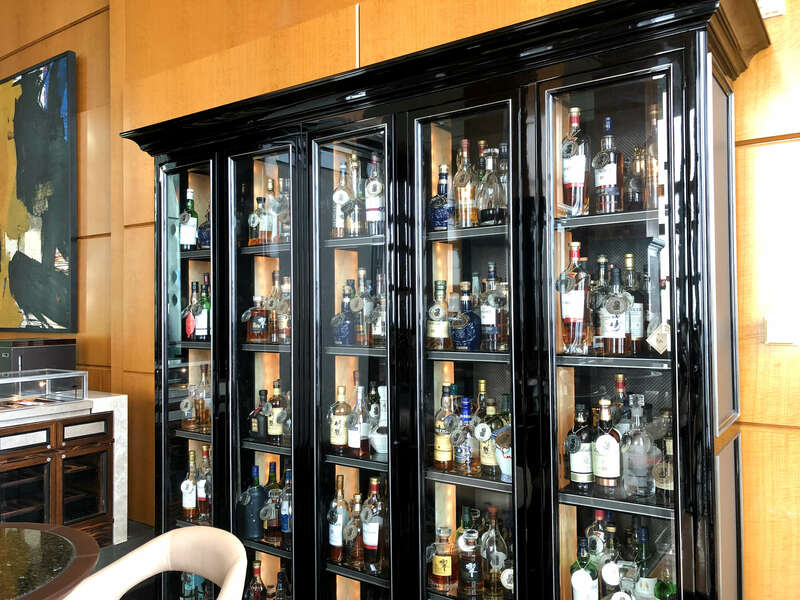 The bar of any hotel is one of the most important places, because in a way it’s the center of it all. Here people come for drinks before heading out to dinner, they have their business meetings here and even might propose to their significant other. The Bar is where it’s at! 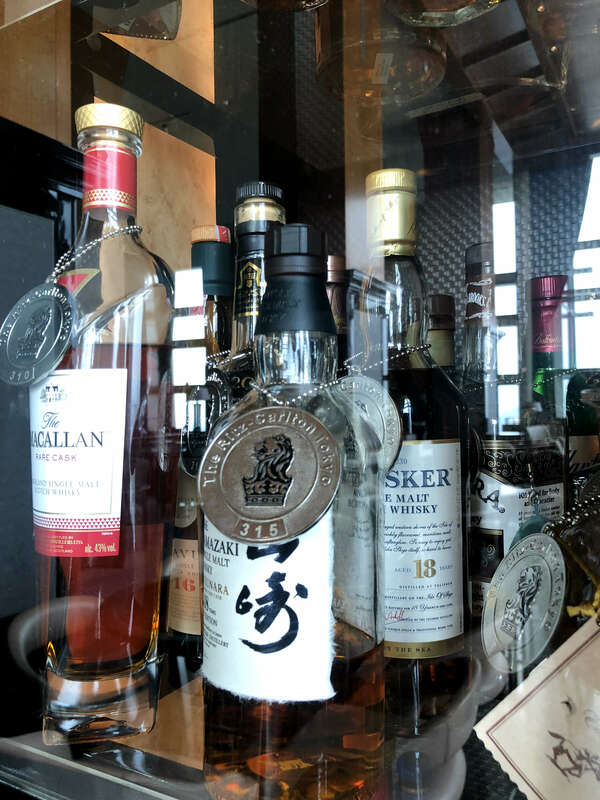 Here you can find an amazing array of drinks including really high-end whiskies from Japan. How about a 30-year-old Hibiki? 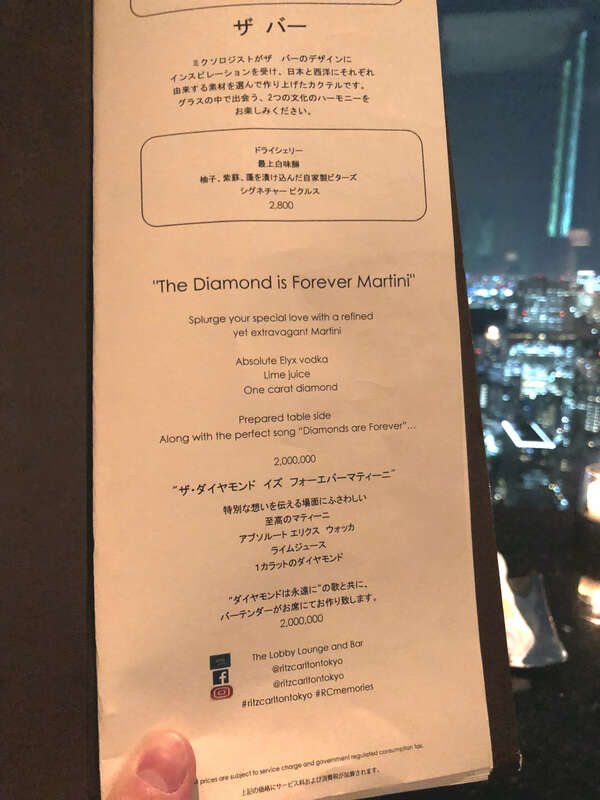 Or maybe you’d prefer one of the most expensive cocktails in the whole world ”The Diamond is Forever Martini”, which costs two million yen, which is the equivalent of around 15 000 euros. 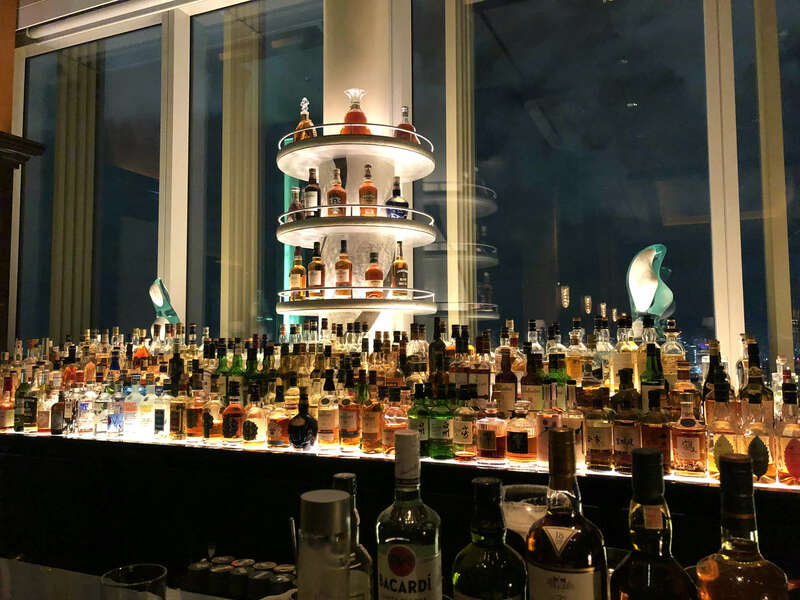 If you are a true regular (this is one of my goals now), you can buy a bottle of alcohol you prefer, for example a neat bottle of whisky (get it? neat…), after which they will keep it for you in their cabinet for your next visit. 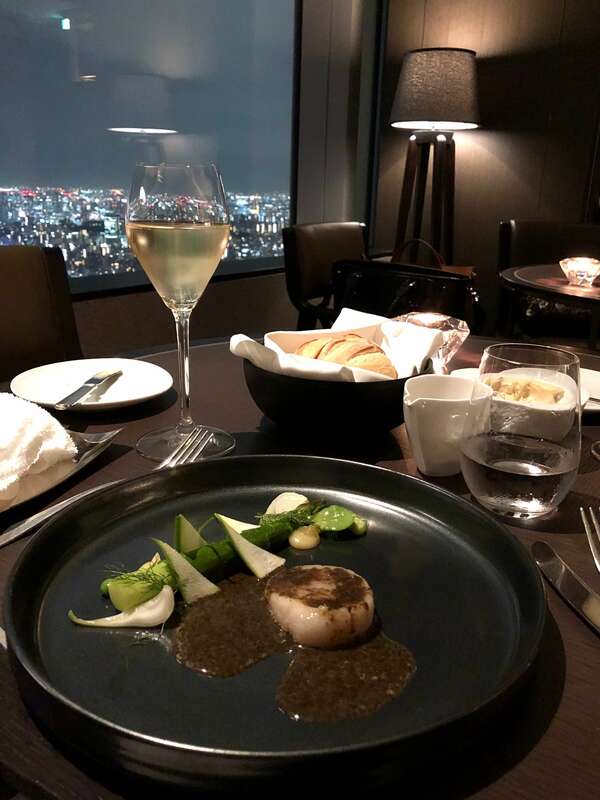 I want to start this part of the blog post with the dinner in Towers, which we got as a part of our collaboration with Ritz-Carlton, Tokyo. 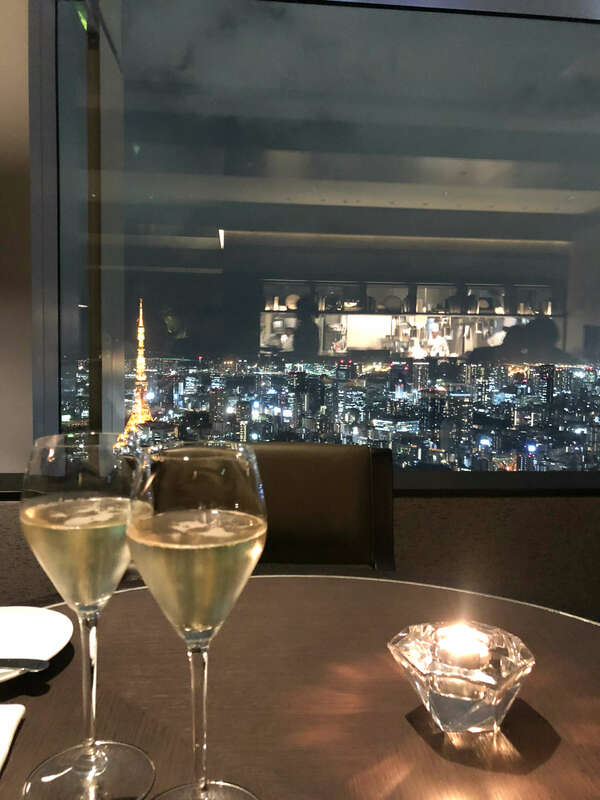 We were seated next to a huge window with a view of the Tokyo Tower and the Minato-area, so that part was covered. 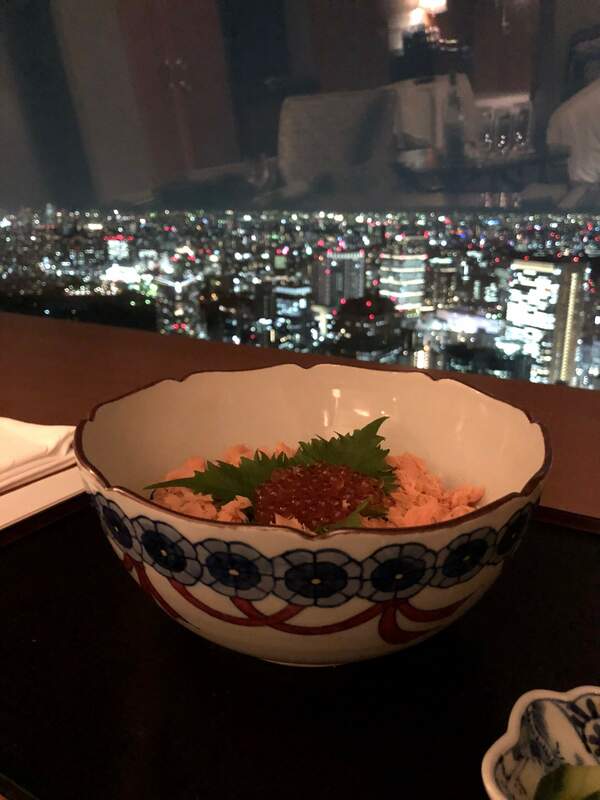 Actually you can get an amazing view almost from anywhere inside the restaurants, so this is a great place to have dinner. We were asked if we would like to order from the menu or if we wanted to give the chef free reign, so we chose the latter. My only request, in addition to food allergies etc., was that I would get one dish with some fantastic Japanese beef. Our starter was a mixture of apple sticks, avocado and orange sauce (and a few other ingredients I don’t unfortunately know). Then came scallops with asparagus and a nori-seaweed sauce, which complimented each other beautifully. There was also a bit of yuzu-mousse on the side, that worked perfectly with the meaty scallops. And of course the asparagus was cooked in a way that it was refreshingly crisp. After this we got a a third dish, which was fish of the day (trout) in French cheese sauce. At this point our main courses differed, because my wife doesn’t eat meat and I do. She got some rockfish and I was served the one dish I had asked before we started – some Japanese beef. I’ve had waguy before and also had kobe on our trip, but this was the first time I had tasted Kumamoto Aka Ushi –beef (it’s a specific type of waguy). Both of these dishes were delicious, like can be expected. 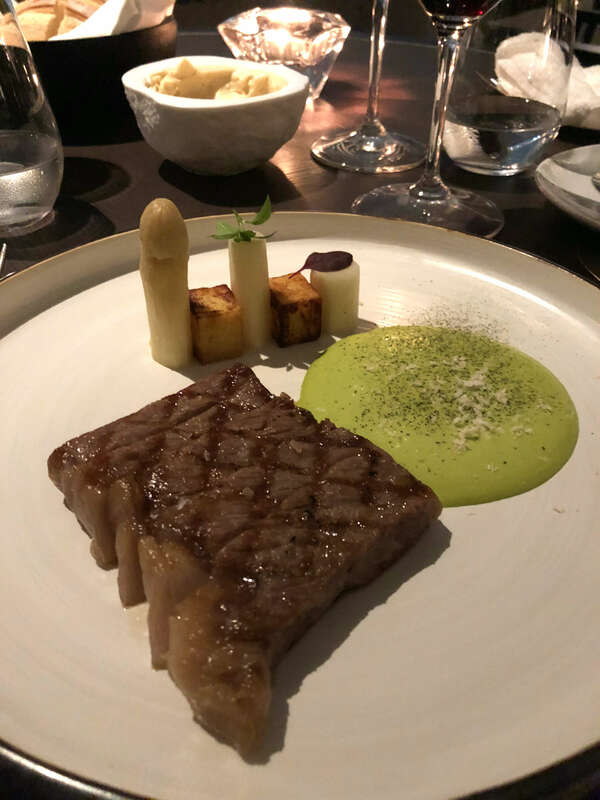 The wasabi-sauce I had with the beef wasn’t too overwhelming, because when eating quality meat like this, you have to let the main ingredient shine. We finished the night off with desserts. 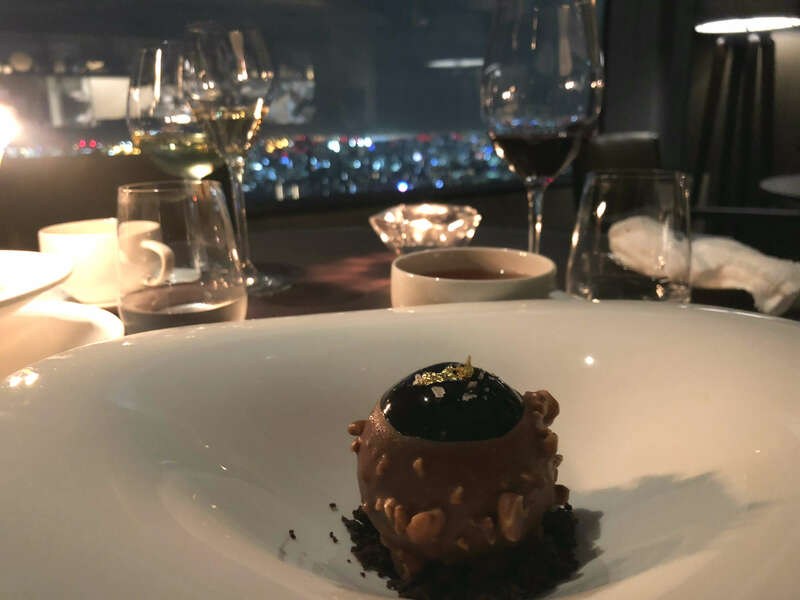 I had the ”Arabica Sphere” , which is a chocolate sphere with a slight coffee taste, molten chocolate and a chocolate mousse within and crispy chocolate on the outside (a lot of chocolate). 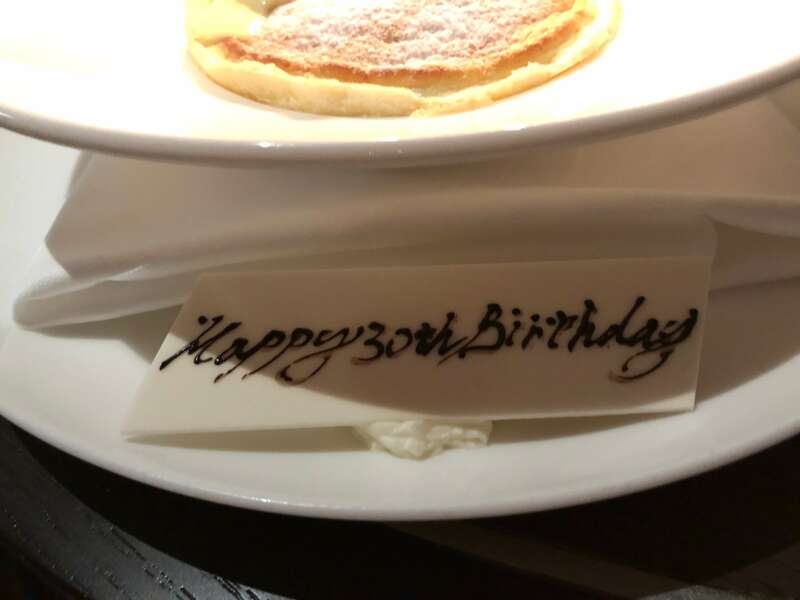 We were celebrating my wife’s birthday, so she got a surprise suflee with grand marnier, vanilla ice cream and a sweet ”happy birthday” –chocolate sign. She especially said that the vanilla ice cream was the best she’s ever had, so all in all our dinner was fantastic. 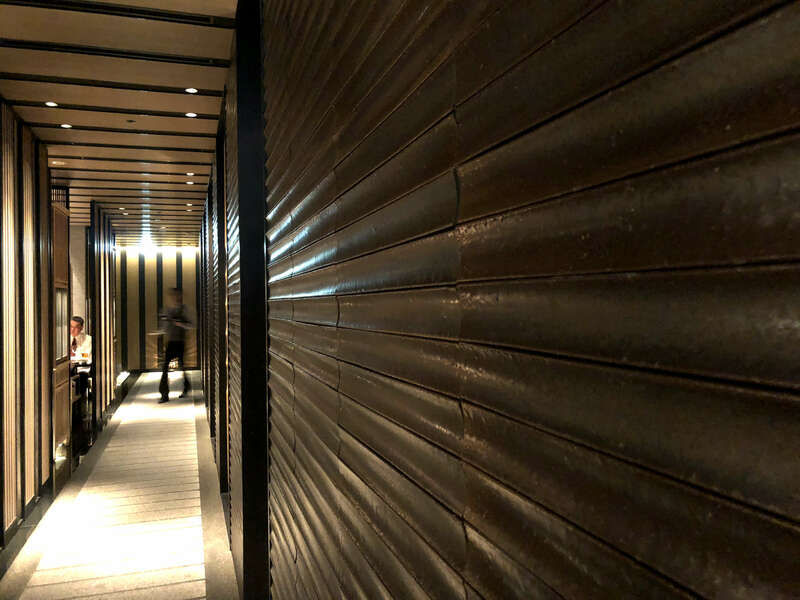 We left the restaurant around closing time, and were so grateful that our room was so close, because we almost couldn’t walk anymore after eating so much. 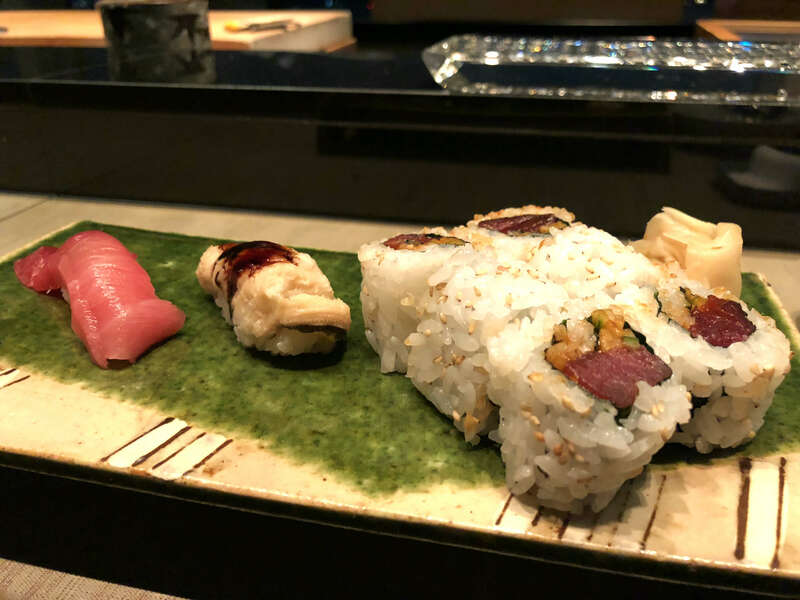 On another night we also tested out the Hinokizaka sushi counter, so that we could have some high-end sushi, that was brought to the restaurant the very same day from the nearby Tsukiji fish market. 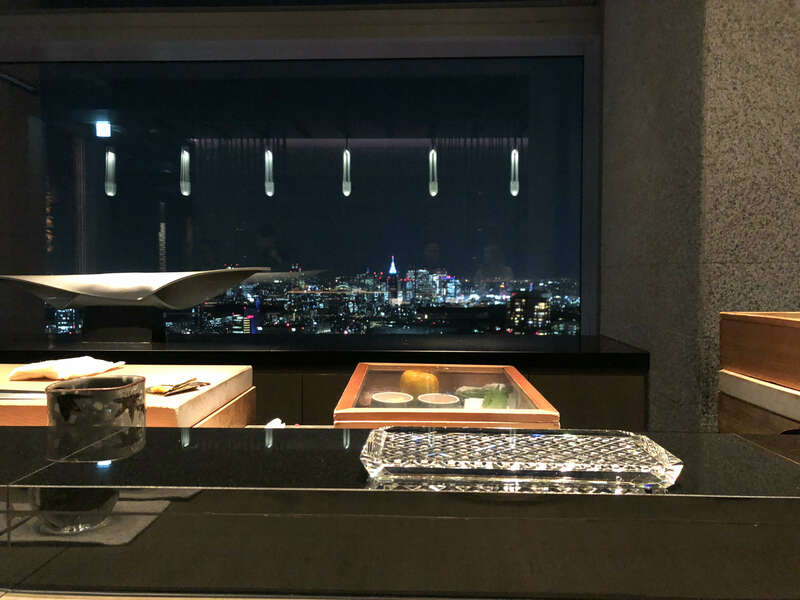 This was a really nice experience, because we had our own chef in front of us preparing tasty sushi, while we watched the city lights behind him. 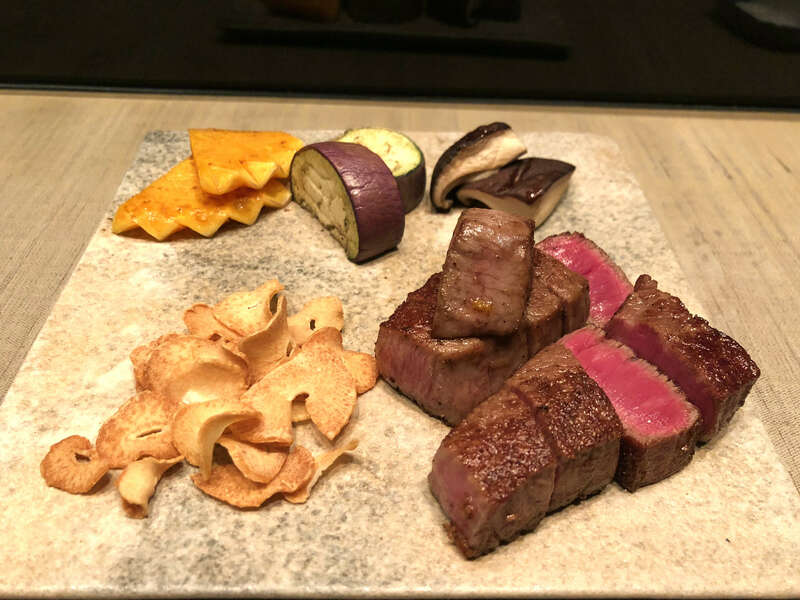 I had also decided to try some kobe beef on our trip, because it is one of the most highly regarded beef in the world. When I got the beef it was somehow almost a religious moment for me. There wasn’t a lot of it, because it is quite expensive, but you really don’t need more. 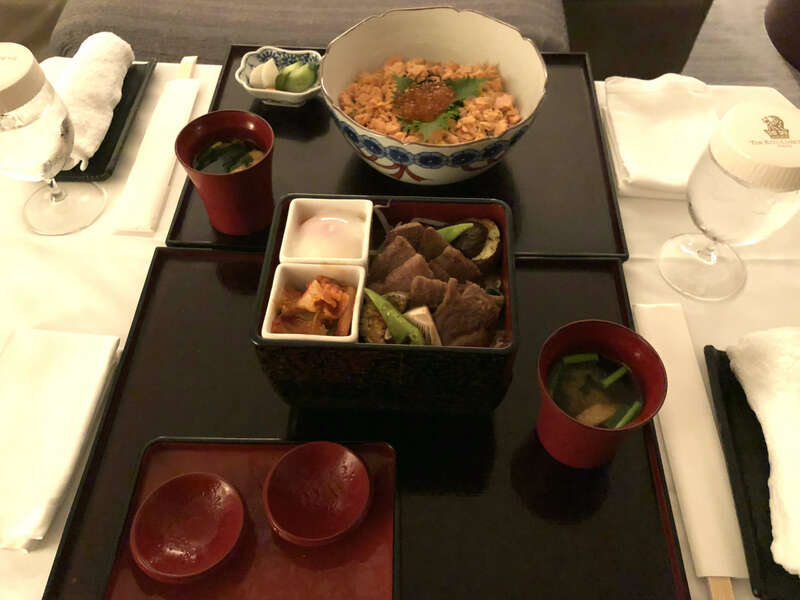 I grabbed the first piece of finely cut beef between my chopsticks, put it in my mouth and concentrated on the nuances and textures like never before. It is hard to describe properly, but it tasted and felt buttery and so tender. When people say ”it melts in your mouth” this really did that. You hardly had to use your teeth, because it just vanished and left a satisfying aftertaste. 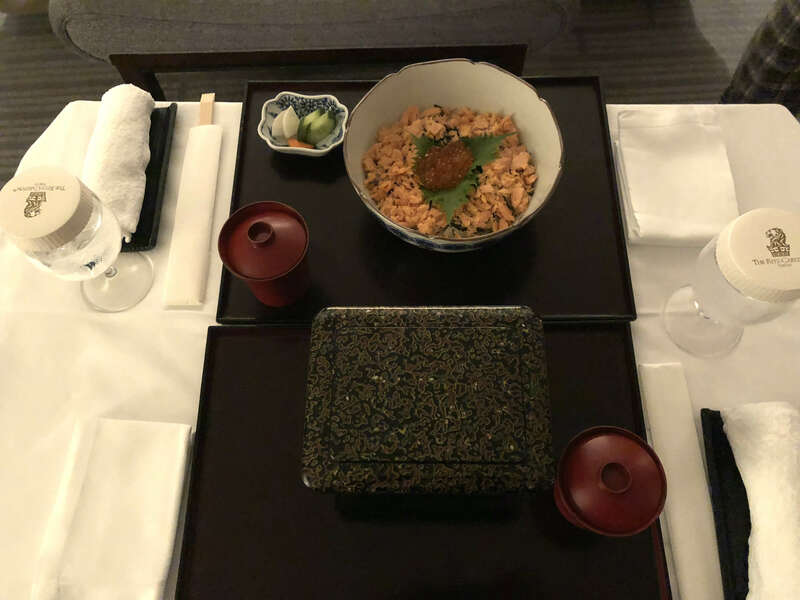 I needed to quickly mention the in-room dining as well, because I was so pleasantly surprised when our food was brought in and it had been placed into these Japanese laquer-boxes. A nice change from normal bowls and plates. 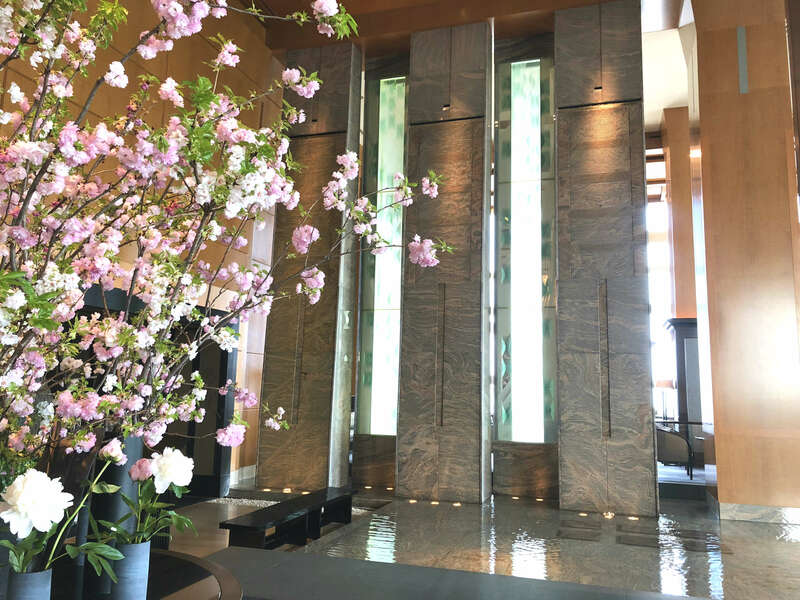 Like I said in my previous post, The Ritz-Carlton, Tokyo is full of small details that will just blow you away, if you realize them. 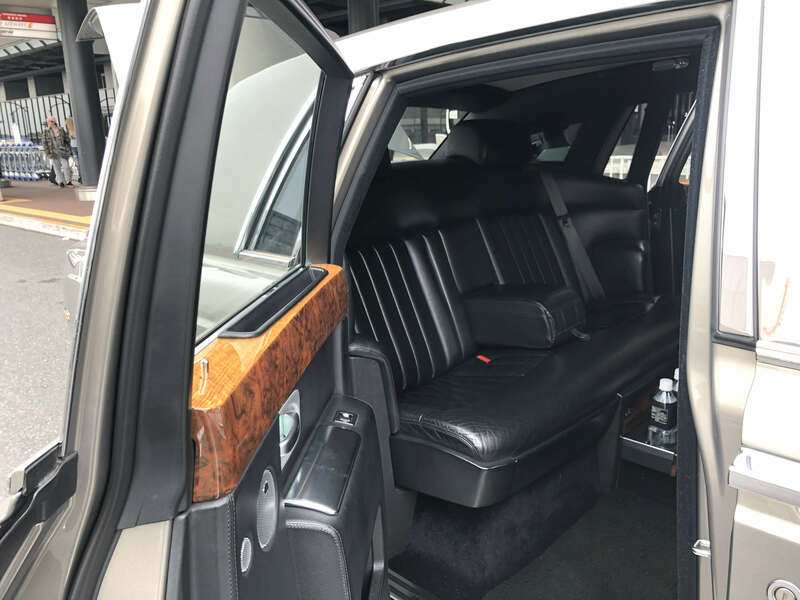 Because we got a private tour of the hotel, we got some information most probably won’t ever get to hear, so here is some of it for your enjoyment. This is something I really admire on each visit to Japan – the amazing glassware they have, especially the Edo-kiriko glass. 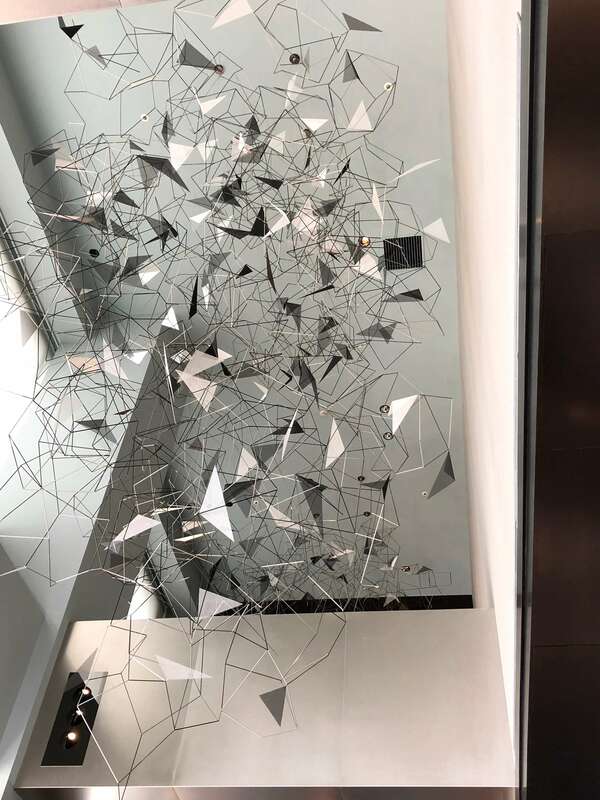 It can be seen in many places throughout the hotel’s restaurants. 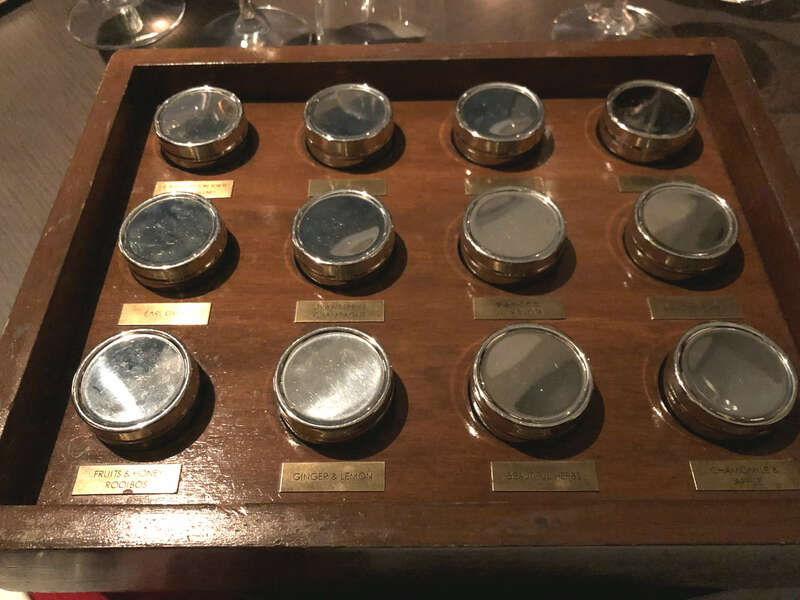 The chefs at Hinokizaka placed the ready sushi pieces onto a beautiful Edo-glass tray. 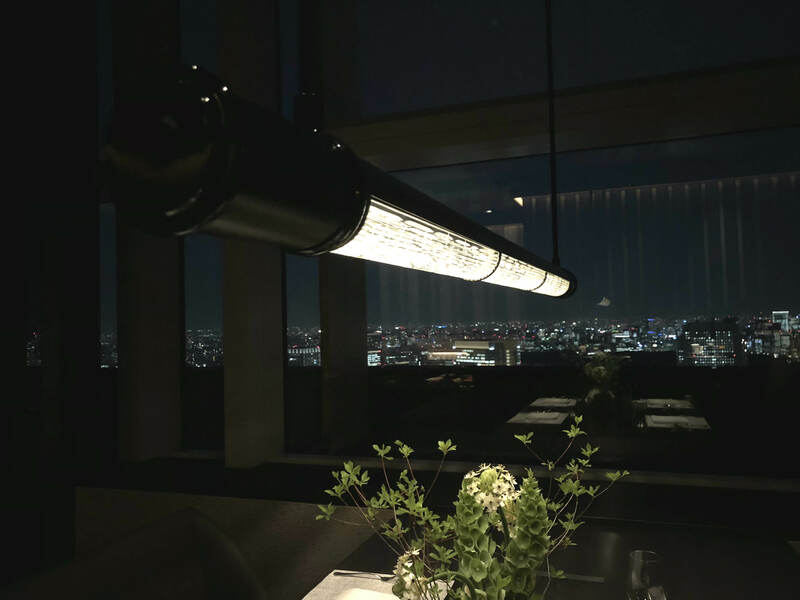 The lights above the sushi counter are also Edo-glass, but one of them has been left unfinished (I don’t know which one), because of the Japanese way of thinking. They believe that once perfection has been achieved, the only way to go from there is down, so they leave a tiny “fault”, so that there is always room for improvement. This really resonates with me. This is once again something that kind of blew my mind. The Kawara-tiles found on the walls of the Hinokizaka are really special. They are Japanese roofing tiles made by Kimura Yogyo in Shimane prefecture. 8 000 of these tiles were made, but only 1 000 of them were ultimately used, because those one thousand tiles fit the wall perfectly. The rest were destroyed. 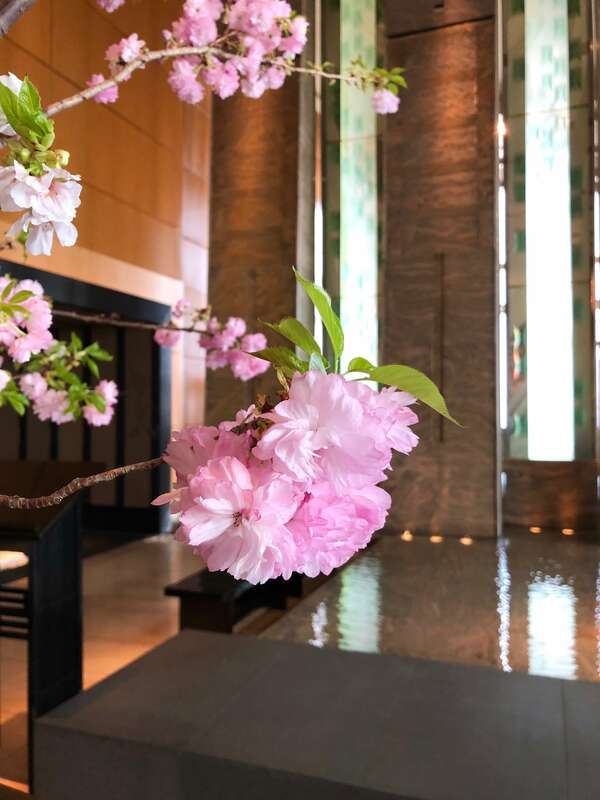 There were also other great details and features within The Ritz-Carlton, Tokyo, so here are some of them. This stone slab represents a pond. Notice the ripples. 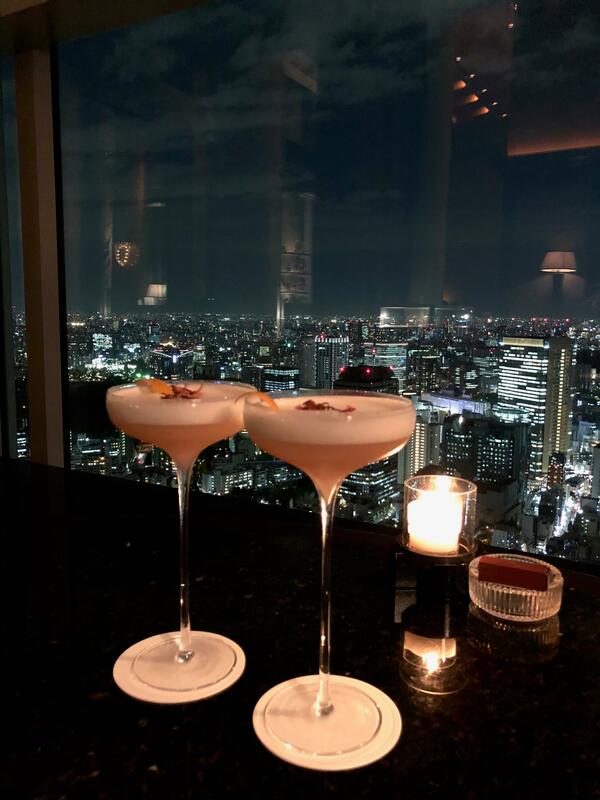 Most guests stay at hotels for one or two nights, so it is unfortunate they won’t have enough time to check out all of the restaurants The Ritz-Carlton, Tokyo has to offer. We only scratched the surface even though we stayed at the hotel for eight nights. 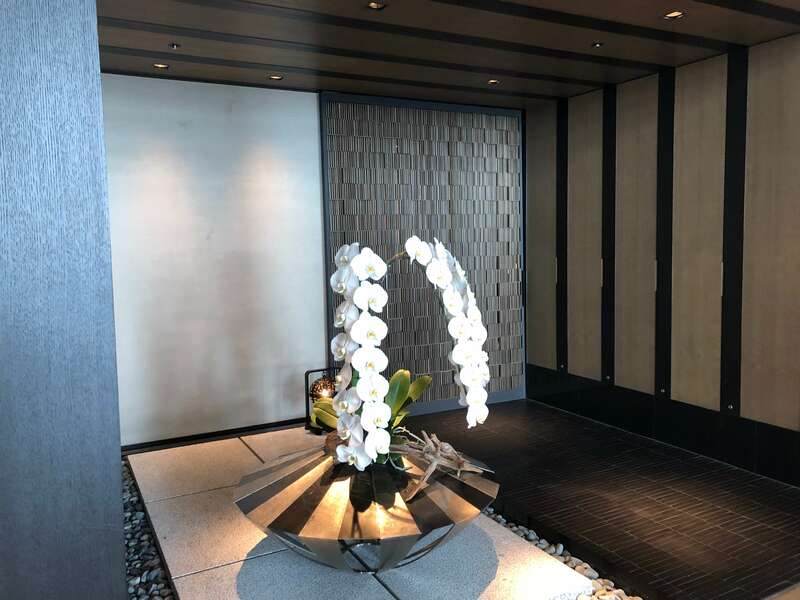 Next time I really want to try the teppanyaki and tempura sides of the Hinokizaka. It was obvious that all of the foods we ate at the hotel were of high quality and prepared with talent, so you won’t be dissapointed here. 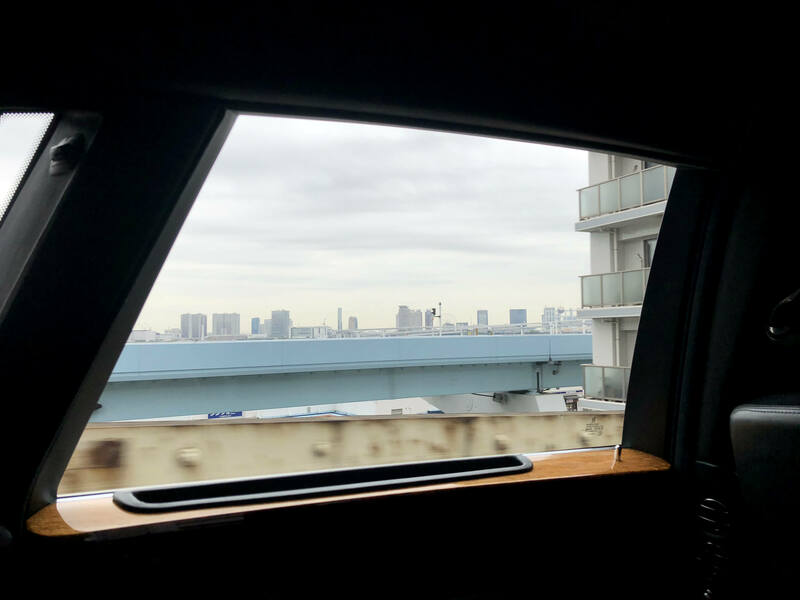 For a long time I had wanted to experience what it’s like to ride at the back seat of a Rolls-Royce, like the rich and famous do, so when I noticed that The Ritz-Carlton, Tokyo had one, I needed to get that experience. 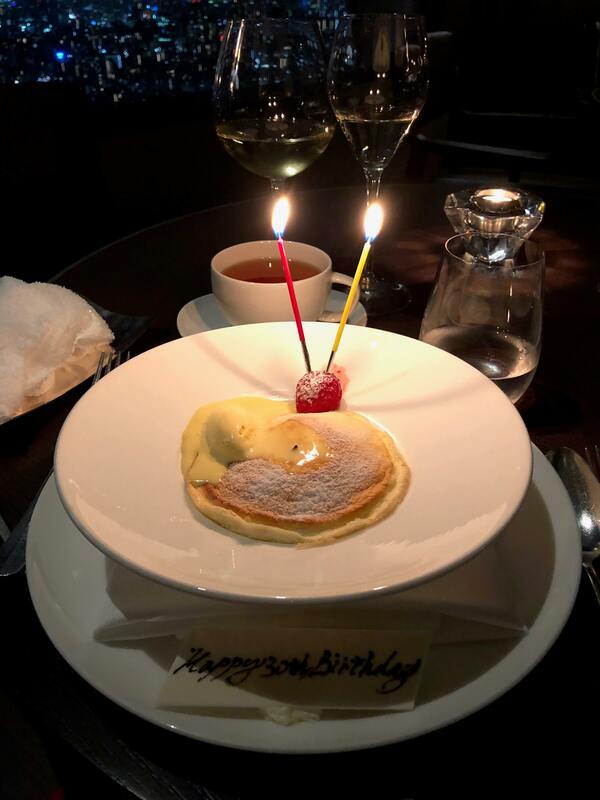 After all, we were celebrating my wife’s 30th birthday, so I wanted to do everything I can to make this trip special. 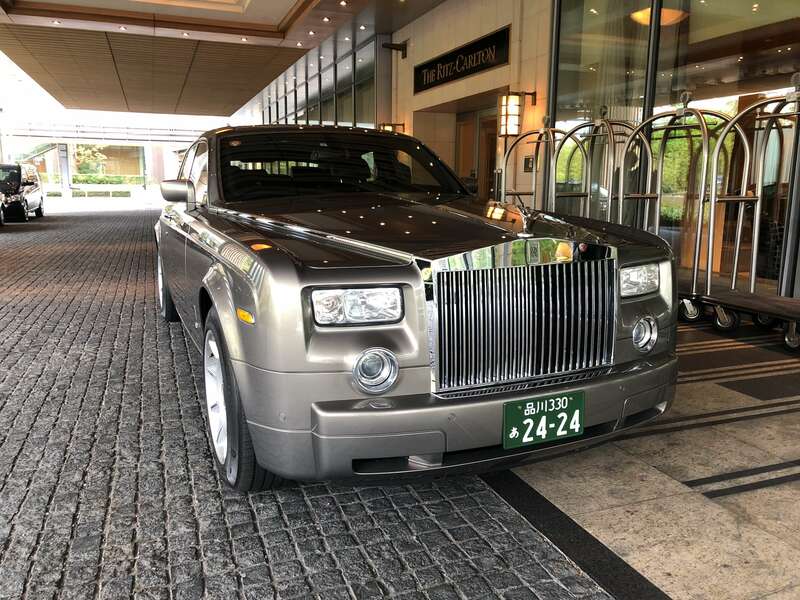 Like I said before, The Ritz-Carlton, Tokyo is a hotel we absolutely need to return to as soon as possible. Hopefully it will happen within this year, because writing these posts is bringing up so many good memories from there that I’m yearning for an opportunity to experience it all once again. 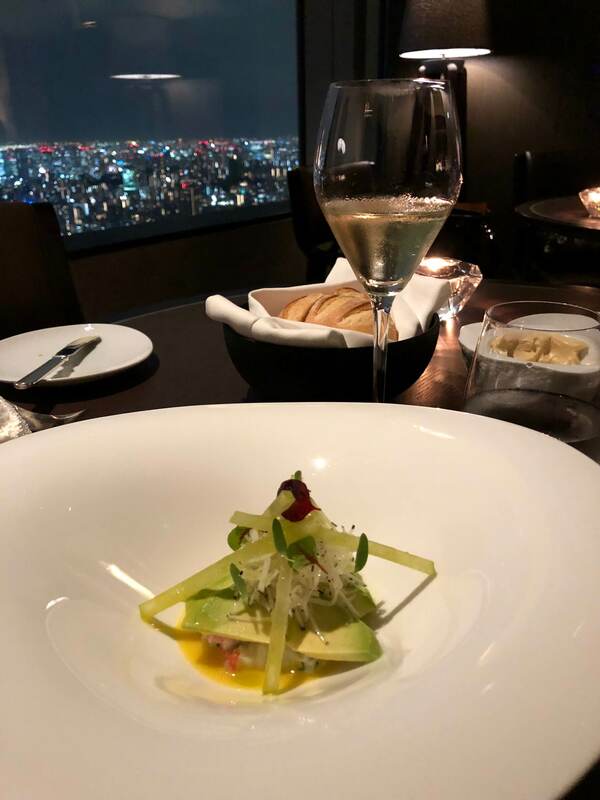 Thank you for reading all the way through, and I hope I was able to give you a good idea of the dining possibilities at The Ritz-Carlton, Tokyo. If you have any questions regarding the hotel, please leave a comment and I will answer as soon as possible. About half of the photos in this blog post were taken by my lovely wife, who you can follow on Instagram here @blackpluswhiteisgrey. 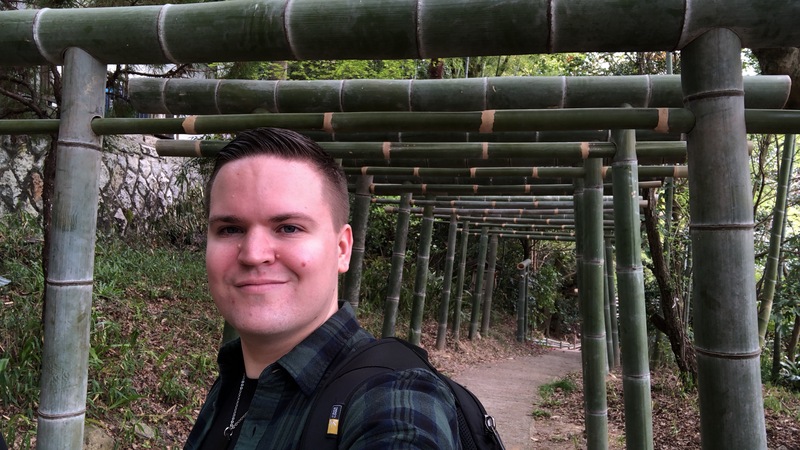 If you want to keep up to date on my newest travels, please go and follow the blog on Facebook and Instagram.